Amount of time devoted to this game since I started playing it just over a month ago--Six hours, 59 minutes. Most recent boss toppled, location reached or milestone achieved--To be honest, Hotel Dusk really isn't the kind of game that prompts you to celebrate reaching a particular milestone--or even recognize that a milestone has been reached. Still, I'll do my best to recall my last "accomplishment." 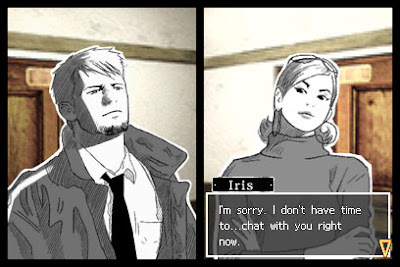 I guess that would be me finally gaining access into a pair of Hotel Dusk's rooms that previously had been off limits to me and the game's hunky (and often grumpy) protagonist, Kyle Hyde. If that doesn't sound like something to cheer about, consider that the titular establishment houses just a dozen or so rooms, and only a few of them are explorable at any given time, especially early on. 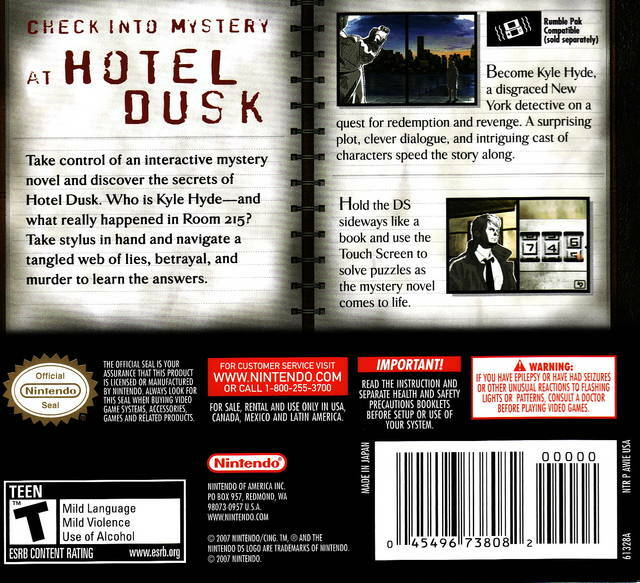 Overall comments on the experience so far--Hotel Dusk is an odd game. Actually, some may not consider it a "game" at all. In a way, I can see where they're coming from, as if any title deserves to be called a "visual novel," this Cing-developed one is it. Admittedly, a couple of the other visual novels I've played to date--such as Hakuoki and Sweet Fuse for PSP--are fairly book-like, too, but both of those titles are more like digital, gamified "Choose Your Own Adventure" paperbacks than the far more straightforward, yet still surprisingly interactive, Hotel Dusk. 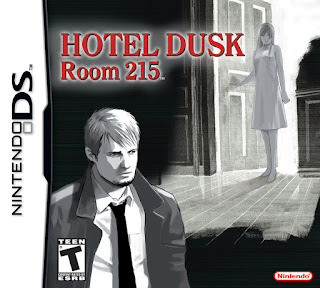 What I mean by the latter part of the above is that Hotel Dusk tells a single, set story from start to finish. No matter what you do while you stalk the halls of this out-of-the-way inn, and no matter which choices you make while you talk with its odd cast of customers, you won't change the course of the central tale. I can appreciate that to an extent, although I also kind of hate it due to how it often causes a Hotel Dusk playthrough to come to a screeching halt. That's because whenever you can't figure out what to do to advance this game's story, you're basically forced to wander around aimlessly, poking your nose into the corner of each and every room while also clicking on anything that happens to catch your eye (and even a few things that don't), until you successfully "pick up the scent" again. Thankfully, that hasn't happened too often during my maiden voyage through this 2007 release--although I think it could be argued that even a handful of times are a handful too many. 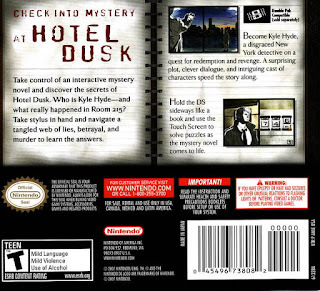 Anyway, despite that above-mentioned quibble, I've gotten a lot of enjoyment out of Hotel Dusk so far. The mystery that serves as its centerpiece is only passable, in my humble opinion, but I still want to see how it wraps up. I’m also pretty fond of the numerous guests who share the hotel with you. Each one has a distinct personality and all are surprisingly likable or dislikeable. (OK, so that’s not entirely true, as I just thought of one character who straddles that line due to how boring she is—but she’s definitely an exception to the rule.) My favorites: the saucy maid, the stoner bellhop and the old lady who sports an eye patch. 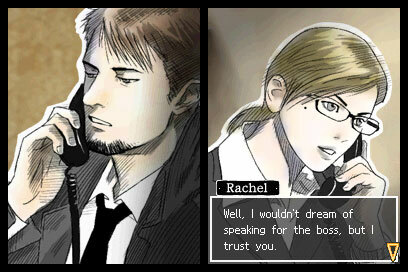 And then, of course, there’s the art style that’s so effectively put to use throughout Hotel Dusk. Specifically, I’m talking about the rotoscoped graphics that call to mind A-ha’s iconic “Take On Me” video, although that’s not the full extent of why this game’s aesthetics are so noteworthy. Also playing a role here is the game’s 1970s-tastic sheen, which helps make even the most mundane passages seem interesting from a visual standpoint. Will I continue to play this game in the coming days, weeks and maybe even months?--Oh, I'm definitely going to finish it; that's not even in question. Will I enjoy it all the way to the end, though? That's far more in question, if I'm to be honest. 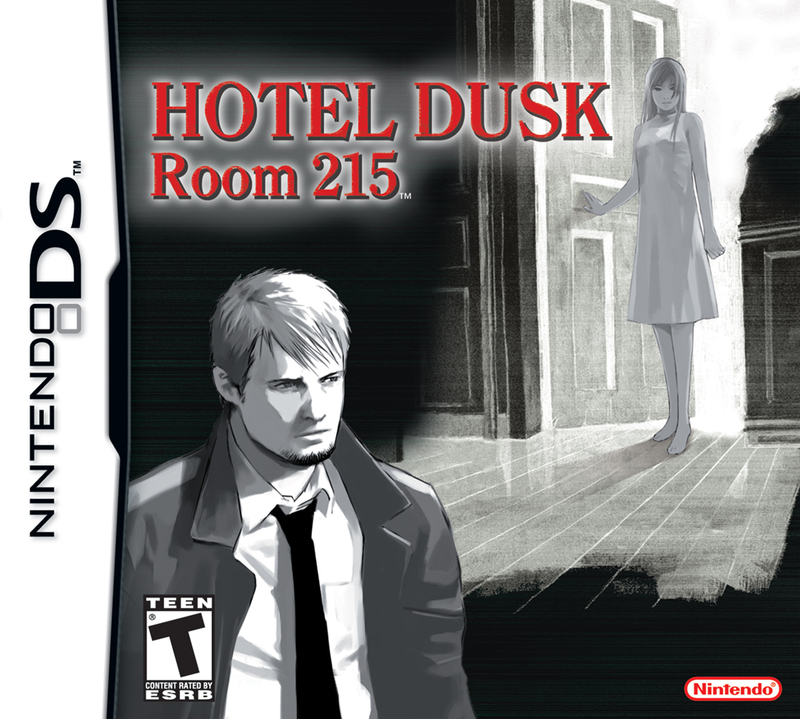 I say that because it seems like Hotel Dusk's more annoying traits are becoming more frequent, not less, the deeper I delve into its story. Assuming that trend continues, I can guarantee my final opinion of this game will be far less rosy than I initially imagined it would be. Do I recommend it to others?--Are you a mystery buff? Are you also a fan of the 1970s—or are you at least not turned off by books or games or movies that are set in that shagadelic decade? If you're able to answer both of those questions with at least a tentative yes, you’ll probably enjoy your stay at Hotel Dusk--or at least you probably won't regret your purchase. Even then, you're likely to encounter at least a few aggravating moments, but all of what I've said here so far should help steel you for them a bit.